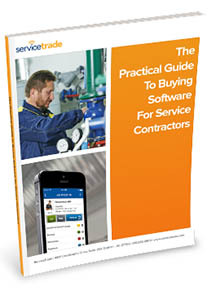 "The Practical Guide to Buying Software for Service Contractors". "The Practical Guide to Buying Software for Service Contractors"
Most likely, your business doesn't have a dedicated software purchasing department...so how can you make sense of the 250+ software vendors trying to sell their product to your service contracting business without going crazy? The Practical Guide to Buying Software for Service Contractors is an 18-page guide that provides you with an easy-to-understand process for guiding your search toward market-leading vendors who will help your business and away from tired, old technology that will leave you disappointed. •Determine the features you really need vs. "fluff"
Download your copy of the Practical Guide today to finally make sense of your software search. Click here to download.